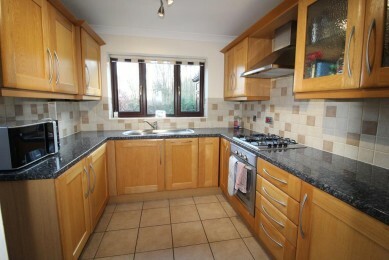 **CORNER PLOT IN A CUL DE SAC** A must view is this well presented three bedroom detached house. With accommodation briefly comprising; entrance hallway, wc, kitchen, lounge with through dining area, conservatory, three bedrooms and bathroom. The property enjoys gas central heating, double glazing, gardens to front and rear, a driveway and detached garage. Located in the popular residential village of Pilley which has easy access to the M1 motorway network making the property ideal for commuters. A front Upvc door opens into the hallway which has a radiator, coving to the ceiling, wood flooring, access to the wc and stairs rising to the first floor landing. With a low flush wc, wall mounted wash basin and front facing double glazed opaque window. Having a range of wall and base units with work surfaces which incorporates a stainless steel single drainer sink. integrated appliances include; washing machine, dishwasher, fridge, oven with gas hob and extractor fan above. There is a radiator, useful store cupboard, rear facing double glazed window and side facing Upvc door. This room also houses the gas central heating boiler. This well presented open plan room is ideal for family living and entertaining. There is a front facing double glazed window, two radiators, coving to the ceiling, wood flooring and double doors which lead into the conservatory. This rear conservatory looks out over the enclosed garden. There is lino flooring, double glazed windows and double glazed doors. Stairs from the hallway lead up to the first floor landing which has a useful storage cupboard and access to the loft. This front facing bedroom has a double glazed window, radiator and fitted wardrobes with overhead storage. Another double bedroom which has a radiator, coving to the ceiling and a rear facing double glazed window which looks out over the garden and fields. This single bedroom has a radiator, coving to the ceiling and a front facing double glazed window. Having a bath with shower above, low flush wc, pedestal wash basin, radiator and rear facing double glazed opaque window. To the front there is a lawned garden with path leading to the front door. There is a gate to the side of the property which in turn has a path leading to the rear garden. The rear garden is enclosed and has a patio seating area and lawned garden. A driveway for two vehicles leads to a detached garage which has an up and over door. way, if any. Prospective purchasers are advised to check these matters with their solicitor prior to entering into any contracts.